Christmas by Design: Private Homes Decorated by Leading Designers written Patricia Hart McMillan and Katherine Kaye McMillan, published by Schiffer Publishing, Ltd is a stunning book to inspire the holiday spirit. If you are like me, the Christmas season brings out my inner decorator and I love to create different festive, warm and inviting looks each year to welcome guests. What I love about the book, Christmas by Design, is that it has gorgeous photos and wonderfully inspired ideas shown in private homes across America. Whether used as a "go-to" reference book for design ideas, as a holiday coffee table book, or as a special gift, this book is sure to be a year-after-year hit. The 255-page book is brimming with holiday ideas with chapter themes: Mediterranean, Color, Magic, Glamour, Romance, Candyland, Treasures, Cozy, Feliz, Funfetti, Tannenbaum, Tradition, Joy, Classic, Love, Retro, Victorian, Neo-Classical, Green, Natural, Nostalgic, Gilded, Tropical, Fairyland, Country, Collectible, Moorish, Merry, and Glorious, featuring interior, exterior, and tabletop creations. One of the many stunning designs featured in the book is the Gawlik Residence in Scottsdale, Arizona, designed by Mark Candelaria. 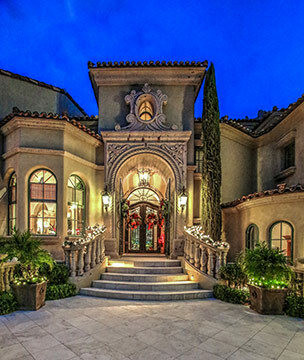 The design is Cozy and begins on the outside of this magnificent home with traditional double wreaths, garland, and bright red ribbons. Inside the home, Mark used traditional greens, red berries, and bright red ribbons to create a warm and inviting ambience. For the living room, he attached a gorgeous red bow to a chandelier and added attractive greens and red berries in a blue and white ginger jar to add interest to a window. A pine wreath with red berries placed on a coffee table, and ropes of fresh pine and red ribbons on the intricately carved fireplace continue the ambience and set the traditional and gorgeous theme. The pièce-de-résistance, was the Christmas tree, a magnificent St. Catherine spruce tree that sparkled in glorious splendor with a plethora of ornaments and red bows tied to the branches, wrapped with a dark green velvet tree skirt with red, white, and green trim. Mark's creative designs span 16-pages in the book and feature different designs in the various rooms of this truly lavish home. In the chapter entitled, Green, Interior Designer Marilyn Trainor Storey features her own home, the Storey Residence in Marks, Mississippi where her use of the color green sets the festive spirit and draws the eyes to the continual flow of style. She also includes a festive recipe for "Marilyn's Easy Grasshopper Pie." For those that like Victorian opulence at the holidays, the chapter entitled Victorian with Christmas décor designs created by Howard Wiggins for the Vollmer Residence in Brentwood, Tennessee, is sure to enchant and inspire your own ideas with attractive stair railing beautifully wrapped in garland and faux white poinsettias, and two stunning trees, one of which he whimsically dressed with tea cups, and another in which he opulently draped with ropes of pearls. 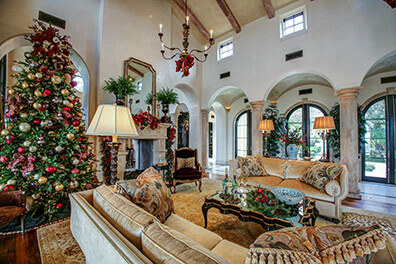 No matter what your preferred decorator style is, Christmas by Design: Private Homes Decorated by Leading Designers written by Patricia Hart McMillan and Katherine Kaye McMillan is sure to inspire your imagination and ignite your festive spirit. Happy Holidays! Patricia Hart McMillan is an interior designer, product designer, and home furnishings consultant and has authored 19 books. She is also a keynote speaker. Katherine Kaye McMillan is a redesign life coach/consultant and a keynote speaker. 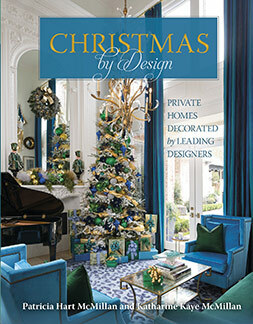 Christmas by Design: Private Homes Decorated by Leading Designers written by Patricia Hart McMillan and Katherine Kaye McMillan is published by Schiffer Publishing, Ltd. and is available as a hardcover. ISBN: 978-0-7643-5654-4, $45.00. The book is available in bookstores and online, including: Schiffer Books, and Amazon.